Does Alex, an African Gray parrot, think? 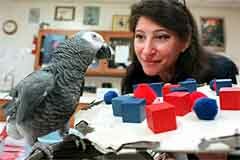 Alex the parrot is urged to count objects by Dr. Irene Pepperberg of the University of Arizona. So, just how smart is Alex? The question of animal intelligence goes back at least to Descartes and his famous aphorism, "I think, therefore I am." Animals cannot think, said Descartes, and therefore are inferior to humans. And for many theologians and philosophers, the ability to think gives man a unique closeness to God. Parrots, of course, are famous mimics, and some parrots have bigger vocabularies than Alex. But no parrot, says Dr. Pepperberg, has been able to perform tasks as complex as Alex can. And she believes that when Alex vocalizes, he is expressing the results of his thoughts, not mere mimicry. For instance, when she asks Alex what color corn is, he answers yellow, even though there is no corn around. This means, she says, he has an abstract concept of what the words "color," "corn" and "yellow" mean. He has not simply memorized them, but can apply them to different objects. Chimpanzees and dolphins have been able to perform equally complex tasks, though the tasks differ from those given to Alex because of the differences between species. But chimps and dolphins, obviously, cannot vocalize in the way Alex does. Few scientists would dispute that Alex is doing something unusual in the history of animal studies. At least, his behavior is more advanced than that of most other parrots who have been the subject of scientific experiments. But scientists differ on the implications of Alex's behavior. Until now, Dr. Pepperberg has published her work in scientific journals, but in January Harvard University Press will publish "The Alex Studies," a book summarizing her experiments with Alex. Dr. Pepperberg bought Alex at a garden-variety pet store in Chicago when he was about a year old with the idea of studying him. As far as she knew, he had no particular pedigree, and she is not even sure whether he is particularly smart in relation to other parrots. Now she is trying to replicate his training with another Gray Parrot, Griffin. But today Alex was being recalcitrant. Dr. Pepperberg had been away for three weeks at M.I.T., where she is a visiting professor this year. When she leaves him, she says, Alex chews at his tail and wing feathers, giving him a rather threadbare appearance, and when she returns he is very demanding, turning his back and saying, "Come here!" "What matter is orange and three-cornered?" she asked Alex, holding the tray of objects in front of him. First, Alex had to identify which object was orange and three-cornered, and then tell Dr. Pepperberg what it was made of. She allowed Alex to pick up the objects on the tray with his beak and to "examine" each one. "I know, I'll give you a nut," Dr. Pepperberg said, sounding annoyed. "Wanna go back," said Alex, meaning go back into his cage. Dr. Pepperberg continued trying to get Alex to perform, but he resisted and she began to lose patience. Usually, said Dr. Pepperberg, that means he is about to give in. "What matter is orange and three-cornered, Alex?" she insisted. "Wool!" said Alex, getting it right. Dr. Pepperberg refuses to call Alex's vocalizations "language." "I avoid the language issue," she said. "I'm not making claims. His behavior gets more and more advanced, but I don't believe years from now you could interview him." She continued: "What little syntax he has is very simplistic. Language is what you and I are doing, an incredibly complex form of communication." Still, many scientists and others remain unconvinced. What about unconscious cues from the trainer? Perhaps the most famous instance of that involves Clever Hans, a horse at the turn of the century who could supposedly count, tell time and make change by tapping his hoof on the ground. It was learned that Hans's trainer was tipping him off to the right answer by tensing his body and moving his head as Hans "counted." More recently, Dr. Herbert Terrace, a Columbia University psychology professor, famously repudiated his own studies in the 1970's with a chimpanzee he called Nim Chimpsky, after the M.I.T. linguist Noam Chomsky. Dr. Terrace taught Nim to use signs that looked as if they were combined grammatically into sentences. But it turned out they were clever imitations of his teacher. Asked about Alex, Dr. Terrace said he thought that what Alex was doing was "a rote response." He calls it "a complex discriminative performance." But is Alex thinking? "I would say minimally," Dr. Terrace responded. "In every situation, there is an external stimulus that guides his response." Thought, he said, involves the ability to process information that is not right in front of you. "It shows Alex is a smart bird," he said. But if you take away Alex's ability to vocalize in a way that seems human, he went on, it would not seem as impressive: "The words are responses, are not language." On the other side of the animal-intelligence debate is Dr. Donald R. Griffin, author of "Animal Thinking," who coined the phrase "cognitive ethology," the study of animal cognition. He believes that animals are capable of complex thought and behavior that is not just instinctive. The discovery that "a bird can express his conscious thoughts and feelings," said Dr. Griffin, "is a great advance. We used to think that was impossible." To Dr. Griffin, Alex's achievements are just one more proof of his contention. Dr. Griffin's views of animal intelligence have been hotly contested. "The intensity of the aversion is incredible," he said. "It's a very touchy subject. Scientists don't like to be told that a valid reason for what an animal does is the possibility that it does it with any consciousness." Dr. Steven Pinker, an M.I.T. scientist and author of "How the Mind Works," said that at the heart of the debate is the question of human primacy. "In earlier times the issue was of whether we are mere animals, and to separate and exalt human worth. Ironically, there has been the same kind of moralistic return from animal fans who say we shouldn't mistreat them because they think and feel the way we do." Dr. Pinker believes that human beings alone are genetically programmed to learn language spontaneously and easily. "I think it is rather an ironic definition of animals to tend to enoble them by training them to mimic humans." Until recently, birds had been thought of as on the low end of the intelligence scale -- hence the term "birdbrain." The point, Dr. Pepperberg said, is that Alex "is a nonmammal, nonprimate, with a brain the size of a walnut." And Alex's accomplishments. she added, show that "animal intelligence is more widespread than we thought." Dr. Pepperberg attributes what she calls Alex's ability to reason and process complex information to her training methods. Most training of birds has followed the conditioning theories of B. F. Skinner, the behaviorist. A bird is taught to say or do a specific thing by a human instructor and is rewarded with food. Dr. Pepperberg initially uses the object itself as a reward so that the bird associates the word with the object. She uses two human trainers instead of one to demonstrate the interaction she is trying to teach Alex. For instance, Dr. Pepperberg stands in front of Alex with a graduate student and orders the student to select a three-sided orange object and to say what the object is made of -- wool, perhaps. She believes that by watching the interaction, Alex connects the graduate student's response to the command. "Orange" she believes, comes to mean to Alex the color of an object rather than the immediate reward of a grape. Dr. Pepperberg says her experiments have implications beyond determining whether -- or how well -- animals can think. She says her methods have been successfully used to train autistic children and children with learning disabilities. Alex's achievements, she said, also underscore the need for stricter conservation of parrots, which are an endangered species. Dr. Pepperberg, who is 50, was born in New York City, an only child who kept parakeets as pets and taught them to speak. She was studying for her Ph.D. in chemistry at Harvard, she said, when she saw a "Nova" series on PBS about chimps' using sign language, dolphin research and why birds sing. She wanted to change fields, but her advisers discouraged her, she said, so she continued her chemistry studies, continuing nonetheless to read all she could on animal behavior. She married and divorced. She has no children. When she applied for her first grant to study bird behavior from the National Institutes of Health, she said, "there were reviews asking me what I was smoking." "People are not at all surprised a chimpanzee can do this," she went on. "You can't imagine -- people said birds were stupid." Dr. Pepperberg expects Alex to live at least 20 more years. Meanwhile, she has added two new birds to the lab. Besides Griffin, now 4 years old, there is Kyaaro, who Dr. Pepperberg believes exhibits symptoms of attention deficit disorder. "Alex doesn't like either of them," she said. "Kyaaro is weird. Griffin is a threat." Right now she is trying to train Griffin to do some of the things Alex can do. Griffin, who learned the word "wool" only recently, has been clinging to it the way a child clings to a new-found possession. One day recently Dr. Pepperberg held up a purple plastic letter S and asked, "What sound is purple?" Griffin stared at the letter. But from the other side of the laboratory Alex made the sound for him, "Sss." "Buttinsky," Dr. Pepperberg said to Alex, and she turned back to Griffin. "What sound?" she asked Griffin again, holding up the S.
Alex died unexpectedly in 2007. Email comments and questions to webmaster@123compute.net.